Crafty Bastards has decided to start a Blog! You may now enjoy our successful and unsuccessful attempts at making some of these Pinterest worthy ideas that we’ve been posting. We’re also planning on giving you a little more of an in depth introduction of the gals behind the scissors… stay tuned! Here’s where I found the original post. 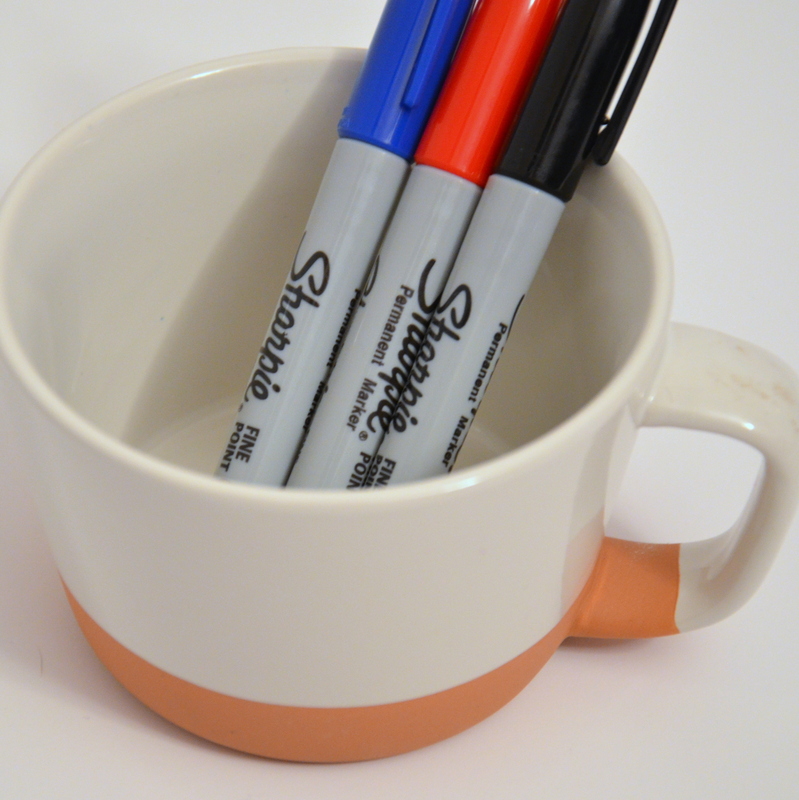 http://sisterssuitcaseblog.com/2013/01/diy-sharpie-mug-valentine-gift.html. We don’t really do Valentine’s gifts at my house other than a few chocolates for the kids, but I’ve been on the lookout for a short mug for my hubby’s espresso maker and decided to try jazzing it up. I found this mug at Target (and I’ll save my post about how upset I am with them for later) and picked up a pack of Jiffy markers. So tops 10 bucks and honestly more than I would normally spend on him, haha. Then I had to wait and wait until he actually left the house for longer than an hour and man he NEVER leaves! So the mug was shoved into my entry closet where I hoped he wouldn’t pick up a pair of shoes and knock it to the ground, and I couldn’t even find the markers but it turns out they were in the trunk of my car, obviously. So there I sat, on my sofa while my kids were downstairs suspiciously quiet. I had written out a few things that I liked about him on a piece of scrap paper and decided to just start writing. 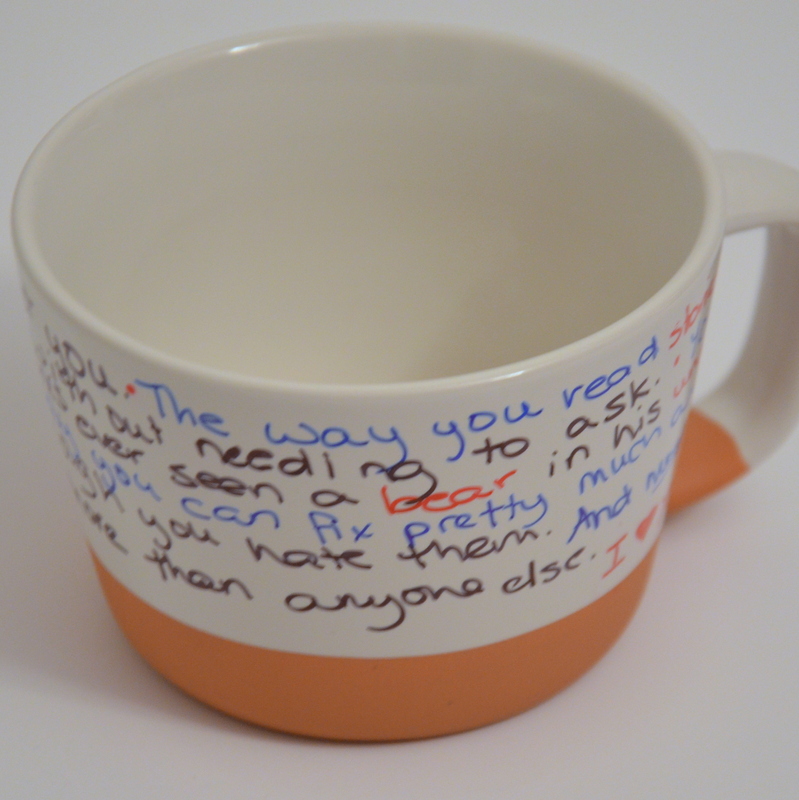 It’s actually not very fluid writing on a curved surface with a marker! My printing was horrid and kept sloping down and I couldn’t figure out what to do at the end of a row when I wanted to move down to the next row so it’s a bit ugly around the handle. You can actually wipe it off at this stage with a bit of spit water and one of your kids clean socks a cloth. Once I had it all written out I just shoved it in the oven for half an hour. At first I half expected to hear a big CRACK! and smell smoke but eventually I forgot about it and the timer rang and it was done! 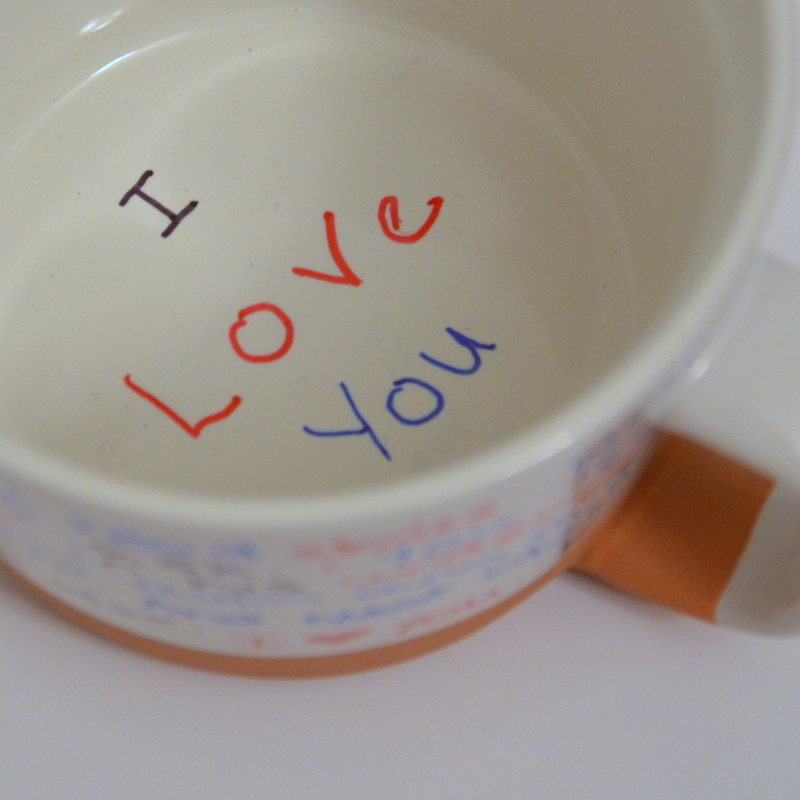 I even put an uncharacteristically sweet little message for him to read at the end of this coffee!!! Bonus points for me! Since I’m not impatient at all my hubby came home and I was all “GUESS WHAT! I made a craft for you!” and then he asked me if it was practical at all (?!). He looked a bit frightened and I told him it’s for Valentine’s day and he said that I should give it to him because he’d look like a chump when he had nothing for me on Valentine’s day. I ran and got it and handed it to him and, check it, he actually liked it! It was a great size for him and he thought it was very sweet. He immediately cleaned it and made coffee. Then he got to the bottom and smiled at his message. Then he said that he thinks the Jiffy marker molecules are rubbing off and going to give him an aneurism. Unfortunately we then put it in the dishwasher and a lot of the writing started wearing off and now it looks like a terrible omen for our marriage, half used up. So if you’re going to make one, either be okay with hand washing it or okay with a curse on your marriage. I volunteered to redo it but let’s face it, I’ve moved on to other crafts. So cute and thoughtful! The key to keeping it on is to get the paint-based sharpie… But they run about $10 a pop. And no dishwasher! Hahaha. Great blog! I’ve seen these on Pinterest too and thought they would make cute gifts for coworkers or stocking stuffers, etc. good to know that they aren’t as easy to make as they look and for the tip about washing them.